Since the introduction of HTML5 videos, it is possible to play videos without any plug-ins. But HTML5 videos offer much more than videos natively display in the browser. With the track function even subtitles can be faded in within videos. These are stored in his separate text file and can be displayed in the video at the push of a button. This is how you make videos accessible to the hearing-impaired and those who do not have speakers at their disposal. The basis for the integration of subtitles is thatElement that refers to the text file with the subtitles and defines the type of text overlay. In addition to subtitles (subtitles), there is also the possibility of captions (captions), Descriptions (descriptions), Chapter (capitals) and metadata (metadata). However, the most common type of text overlay is likely to be the subtitles used to render the spoken word. The subtitle output is also the only text overlay supported by “normal” browsers. All other types of overlays can only be interpreted by special screen readers for people with visual impairments. 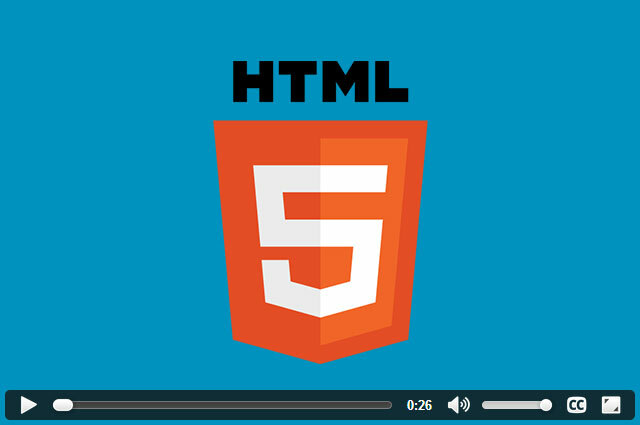 The following example shows a classic integration of an HTML5 video. ByElement, different video formats are included because each browser prefers a different format. Two followElements – one for subtitles and one for descriptions. The type of text overlays is over thechildAttribute is determined. While the valuesubtitlesclassic subtitles are reproduced bydescriptionsDescriptions reproduced. Descriptions, for example, are used to render a scenery in textual form. If you want to make videos accessible to people with visual impairments, it makes sense to have oneElement for descriptions. Screen readers can then output these descriptions. Other browsers ignore Description tracks as well as the other tracks (except for subtitles). About thesrcAttribute specifies the file in which the texts for the video are stored. For the browser to interpret the overlays, they must be stored in a specific format. The common format isWebVTT: Web Video Text Tracks. In the example, we deposit subtitles in German and English. The attributedefaultindicates which language should be played by default. The text file is introduced with the specification of the used format. The individual text overlays are separated by blank lines,cuescalled. EveryoneCueconsists of specifying a period of time during which the overlay is to be displayed as well as the text to be displayed. WEBVTT FILE 00: 00: 05.000 -> 00: 00: 20.000 I want to see that in black and white. 00: 00: 35,000 -> 00: 00: 50,000 Me too. In the example, the first text fade starts at five seconds and ends at 20 seconds. The time span must be specified exactly as shown in the example. For the two times, it is mandatory to specify hours, minutes, seconds and milliseconds. The separation of insertion start and end is done via “->” and is separated from the times with spaces. Then we indicate the text to be overlaid. This can extend over several lines. Only with a blank line will the next display be started. Once for a video perSubtitles are deposited, an additional button with the caption appears in the control barCCfor “closed captioning”. This button will show and hide the subtitles. If there are subtitles in several languages for a video, clicking on the button displays a list of available languages. Owns one of theElements thatdefault-Attribut, the subtitles are automatically activated. However, they can also be switched off again via the button. By default, the fonts are in white text on a black background. Stylesheets, however, can be used to customize the look of the overlays. For this there is the pseudo element:: cue, In addition, it is possible to change the font and color as well as the background color for the overlays. The information in the example shows the fonts in black on a white background. In the example, the first video element of an HTML document and pertext tracksthe first in this excellent track addressed. About the propertyFashioncan the fade in (showing) and off (hidden) become. In the example becomes the fourthCueof the first track. Bytextthe corresponding display text is output in an alert. All current browsers support this-Element. Only the Opera on Android and the mobile Safari do not play along.